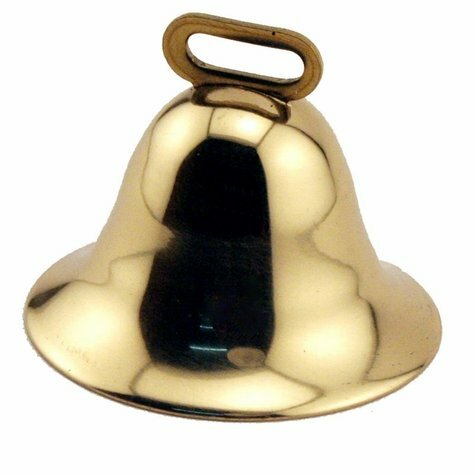 Brass Sportsmans Hunting Dog Bell. $4.99. "Great tone. Just loud enough for pup." Great tone. Just loud enough for pup. "I'm hard of hearing and most bells I barely hear and these are the best." I'm hard of hearing and most bells I barely hear and these are the best. I use them on my Lovetts hawk scream collar that I run quite, and the hawk scream kicks in when he's on point. Great combo. "I like the sound of our jingle dog bell (which you should call it!)" I like the sound of our jingle dog bell (which you should call it! ), and it reminds Cady of her obligations when she is out chasing birds. "Great bell, well made & the noise carries." Great bell, well made & the noise carries. Better than I expected. Makes plenty of noise! I purchased to put on my dog when he goes with us trail riding so I have an idea of where he is. Works like a champ. Quality craftsmanship and as always excellent customer service! "Quality constuction and nice sound!" Very nice bell. Quality constuction and nice sound! "Love the sound...and seems to be built very sturdy." Love the sound...and seems to be built very sturdy. Time will tell. My girls wear their bells daily for hikes in woods and on trail rides with the horses! Very nice product. Just a little bit bigger than I wanted, but still a very good product with a nice loud and clear tone. I would still recommend this product to anyone. "The bell is larger than I really wanted, but I do like the ring." The bell is larger than I really wanted, but I do like the ring. It is meant to replace a bell that I loaned to a friend. I use this to keep tabs on my dog when we are taking walks through the woods, as he likes to get on scents and birds.